Our tips and betting strategies are a quick and easy way to get started. The Over 1.5 goals system is a far more reliable way to place bets than ordinary Over 2.5. "Under 1.5 goals" means, we'd expect 0 or 1 goals. "Over 1.5 goals" means, we need to see at least 2 goals in the match. 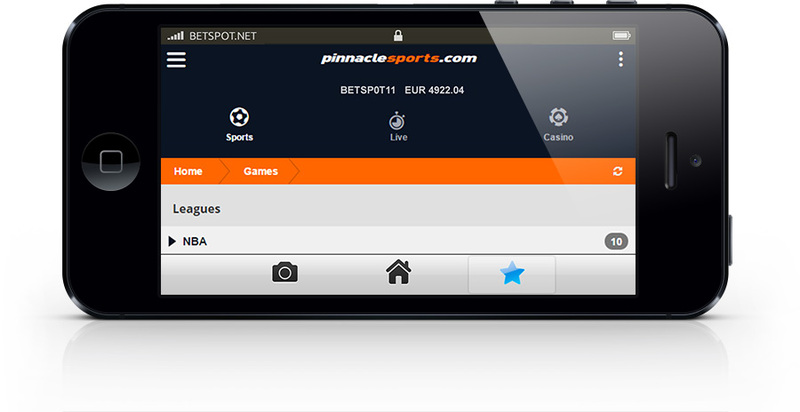 Bets for this strategy are never placed before the match, only on Live In-play games. The odds for Over 1.5 goals tend to raise fast. Before the game prices for Over 1.5 goals are 1.30 or more. Not enough to make a decent profit. Once the game begins each minute without a goal raises the odds. After 15 minutes you can expect odds about 1.45 and after 30 minutes about 1.70. If the first half doesn't produce any goals at all - the odds could get up to 2.0 or over! This is what we are waiting for and that's when we'll place our bet. If you want, you can place a bet after 40 minutes in the first half or during the half-time. The sooner you place, the lower your profit will be. Once the goal is scored the odds will drop usually back to 1.5 and putting you in a perfect position to sell the bet or make a cash-out if your bookmaker supports that. The time of the first goal also determines how much you'll win. In an ideal position, the first goal will be scored between 46th and 55th minute. And that happens very often! Don't place any bets in the first 30 or 40 minutes of the game. After that (preferably during half time) bet on Over 1.5 goals! Use this strategy on games that are available for live betting and the game is a strong candidate for Over 2.5 goals. If an early goal surprises you - forget this game and move on. This strategy is not suitable anymore. Here is a list of games we played during our strategy testing period. We have listed the time of placing the bet, the stake and odds. Roma - Cagliari. In 27' minute Over 1.5 goals - 30€ @ 1.5. Goal soon after that and Lay at 1.19. Portsmouth - Newcastle. 47' - back Over 1.5 goals - 30€ @ 2.44. Goal one minute later - Lay 30€ @ 1.41. The game ended 0-3! Hoffenheim - Schalke - 26' - Back Over 1.5 goals - 50€ @ 1.55. In 39' minute goal and Lay 47€ @ 1.19. Malaga - Nunmancia. 46' - Back Over 1.5 goals - 22€ @ 2.36, in 88' minute two goals for 2-0! Kaiserslautern - Freiburg. 15' - Back Over 1.5 goals - 69€ @ 1.50. No goals. In 30' again 20€ @ 1.90 and in 46' minute once again 12€ @ 2.36. First goal in 57' minute, and another one later. All bets won! Charlton - Derby. 15' - Back Over 1.5 goals - 40€ @ 1.6. In 35' goal and Lay 40€ @ 1.21. All games have made money! Only two out of ten were losers - Sassuolo - Ancona (-16€ - one goal scored and it was too late in the match to trade without loss) and Recreativo de Huelva - Osasuna where we placed the bet in 47th minute 16€ @ 3, but the first goal came very late in the 87th minute. Too late to trade. First we placed a bet on Over 1.5 goals at 1.55 and once again at 2.5, and both goals were scored in the last three minutes! +74.18€! Over 1.5 goals is a great universal system. The only downside is - you'll have to watch the games or at least keep a track of live-score and you'll need time to do that. But in the end - it's worth it! If you're serious about making money with betting, this strategy could be one of your main money makers. If the goal is scored in the first 60 minutes of the game, you'll be making money if you cash out or you can leave the bet open and wait for another goal. This depends on what you see if you're watching the game. If the goal is hanging in the air - keep it open. Play this strategy on a betting exchange or on our bookmakers with cash-out function. This strategy allows you to earn a lot of money without a big risk to your bank. We'll bet on Over 0,5 goals on a football (soccer) game. At least one goal has to be scored by one of the teams. Only a 0-0 draw destroys the winning sequence. If you choose your games carefully, you can easily get through 30 or 60 rounds in a row and that's what we're aiming for. The system is progressive. You have to bet all-in in every round. The system is played on the betting exchange on in-play games - during the game. You could also use any other bookmaker that offers live betting, but you'll get better prices on the exchange. Set a stake to start with. 2€, 5€ or 10€ will be enough. Find a game which you're confident will not end with a 0-0 draw. choose the Over 0.5 goals market, or Total Goals market. Sometimes, the Over/under 0.5 goals market has more money available than the Total goals market and vice versa. Check them both out if you're playing on a betting exchange. The Over/Under market pays out winnings within minutes after a goal is scored, while on Total Goals Market the game needs to end before the winnings are paid out. You decide which one you'll use, both mean the same - at least one goal in the game. DO NOT PLACE BETS BEFORE THE GAME. WAIT FOR THE GAME TO START! IT HAS TO BE AN IN-PLAY GAME, WHERE YOU CAN PLACE BETS LIVE DURING THE GAME! If you're expecting an early goal - you want to place your bet as soon as the game starts. Our tip - the odds for Over 1 goal should be at least 1.11! Do not place bets before that. If an early goal surprises you simply move on to the next game. You have to keep in mind that the exchange also takes 5% commission of your winnings, so wait for 1.11 (at least). You really shouldn't place anything below that. You could wait up to 30 minutes. Statistically first goals are scored around this time. This will increase your prices even further. Wait for the first half to end without goals and place the bet during halftime. This will boost the odds above 1,20 and increase the winnings. This is the recommended option for betting on Over 0.5 goals. You decide what works best for you! Let's take a look how much you can win using this strategy with a 10€ stake. 10€ x 17 = 170€! 10€ x 237 = 2.370€! It's worth taking a look at "over 0,5 goals" betting strategy. 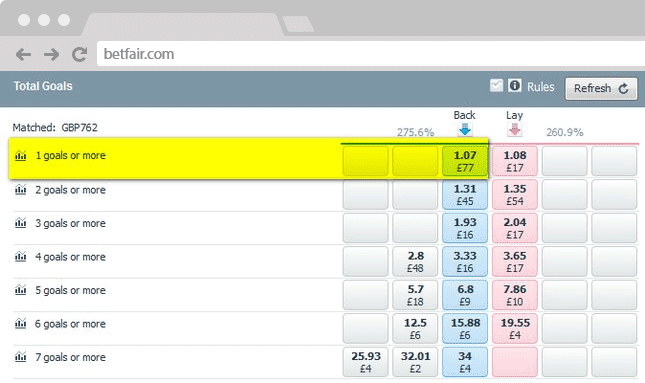 And don't forget - play on a betting exchange and take advantage of higher prices and bigger market liquidity. A very important part of sports betting. Betting without money management can be disastrous. With flat unit betting stakes you always bet the same amount. Choose how much a unit is worth (between 3% and 5% of your bank). The games are then put into three categories - 1, 2 and 3 unit plays. 1 unit means - it's a risky game, 2 is regular, 3 is a game well worth betting on. You should never bet more than three units! This is the most widely used money management with professional bettors. It's popular to revaluate the unit at the end of the season. It depends on your bank how much it has grown or shrunk, take 3-5% of it and this is your new unit. Another important factor when using units is - always keep your odds close to 2.0! Double your stake every time you lose. An example: Bet 2€ on a game. If you've won, bet 2€ in the next game. 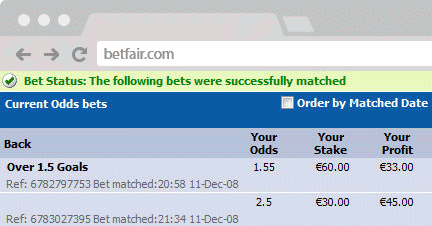 If you lost, double your stake and bet 4€ on your next bet. If you lost again, bet 8€! Always double your stake if you lost. Once you win, you'll get everything back + make the 2€ you bet in the first place. You have to be careful to choose games with odds of at least 2.0, otherwise, you won't get back in the game and constantly lose money. Martingale is popular in casino games, where you can try it on Roulette or BlackJack (21). Keep betting on black (always double your stake if lost) and sooner or later you'll win. Double your stake only if you win. If you start with 2€, win a bet at 2.0, and lose - you'll continue with the 2€ stake. If you've won - you'll bet 4€ on your next bet. In case you've won - bet 8€ and so on. Always double your last winning stake. If you lost, return to the 2€ stake. This system can make you a lot of money if you're on a winning streak. We recommend using the unit stakes. Whatever you choose, everything is better than betting without discipline and a plan. Can you pick a winner, not once, not twice, but 15 times in a row? Start with 5€ and bet them on one or more matches (single, or accumulator bets) with a single or combined odds of 2.25. If you win - keep 25% of winnings on your account and bet the rest on another bet at 2.25. Continue doing that for 15 rounds. In the 14th round, keep 57% and bet the rest, in the final round - withdraw everything. If you get through all 15 rounds, you'll make about 20.000€! If you fail one round, go 2 steps back. Three consecutive losses will put you back to round 1. It can happen, but you can lose only 5€! Everything else is bookies money anyway. Think about it - 5€ investment and 20.000€ potential profit. Well worth trying. This strategy has been successfully tested during one tennis season with a big profit. A classic scenario that repeats itself in tennis is - the favorite will have a slow start in the first set. And this is the moment you are waiting for. How to approach the game? Favorites usually come with very low prices not worth betting on. Take Djokovic for instance. He is rarely above 1.10, but that kind of players lose, too! Both players use the first set to get in the game, to "touch and feel" their opponents and to analyze their game. As soon as our strong favorite falls behind (which happens more often than you think) we will place a bet on him. 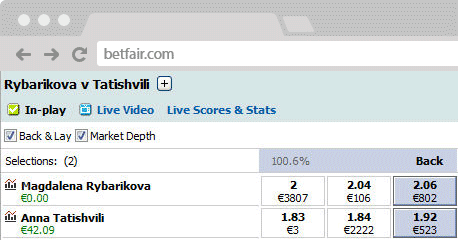 We are waiting for the underdog to break his serve and this will raise our favorite player's odds instantly. If you're lucky, the underdog will double break him and increase the prices even more! Make sure when our favorite is behind that he is available at at least 1.80 or over. Now, you are ready to place a bet on him. One simple break in favor of our favorite will lower the odds enough for a successful cashout. As soon as we back our favorite, we wait for his/her awakening. Strong favorites almost never go down in straight sets! There is always fight and struggle. When do lay or cash-out our favorite? You decide according to what you see in the game. Is he trying or is the body language telling you he has given up on the game? The golden rule should be - lay or cash out your bet as soon as your favorite re-breaks his opponent and his odds are lower than the one's you placed a bet on them. If you play on a betting exchange - lay with the same amount you have placed a bet on them. This way, you'll create a risk free bet. If possible DON'T SPREAD YOUR WINNINGS YET! Later, when our favorite is really hammering his opponent - back the underdog to spread your winnings across both players. 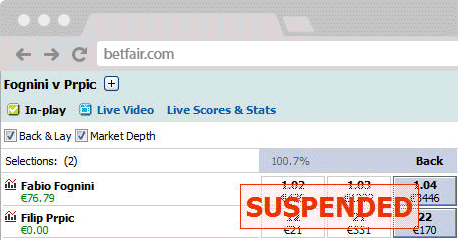 From experience - we usually create a free bet and wait for opponent to rise up to 4.0 and spread the winnings. Only games with clear favorites (in your opinion) should be played. Don't place any bets in the beginning. Wait for our favorite to fall behind - getting the first break on his serve. As soon as our favorite is behind, wait for his odds to get close to 1,80 or over and place a bet on him. If the odds are still not high enough, don't place a bet because it will make it impossible to trade! Once you've placed your bet, wait for our favorite player to get back in the game and re-break the opponent. If it doesn't happen in the first set, wait for the second one. There is still enough time. As soon as this happens, and if you're happy with the profits, lay our favorite with the same amount you have back-ed him. 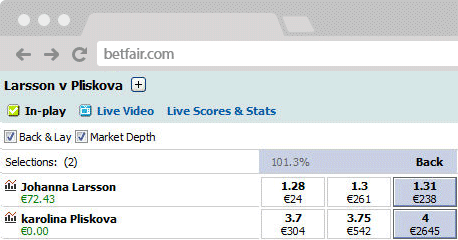 Example - Back Wawrinka with 20€ at 2.0, now you will lay him with 20€ at - let's say 1.30. This creates a free bet you can't lose anymore. If you're confident he'll win the match, leave it like that. If you want to spread the winning across both players, make sure the underdog's odds are at least 2.0 (preferably 4.0 or more). Now take a some money from your free bet and place it on the underdog. You will make money no matter who wins the game. If possible - watch the on your tv or live stream to make sure your favorite isn't letting you down! If the favorite won the first set, leave this game alone. It's not worth betting on anymore. Move on to the next game. A variation of this strategy is - leave the first set alone. Just watch the game and if our favorite lost the first set, place a bet on him in the second set. This way you'll avoid additional surprises in the first set. Should our favorite win the first set - you could wait and see if he loses the second set. You could then back him in the third. There are hundreds of different approaches to betting and every player has a different strategy. Our betting strategies are only a quick start and an eye-opener to show you what's possible. Whatever you choose, we at Betspot wish you good luck!